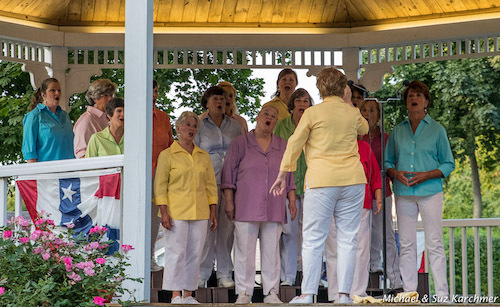 The main purpose of Cranberry Shores Chorus is to get out and sing for our community. We sing at annual shows, a number of community events, and at the annual Sweet Adelines Region One competition. We are available to sing at your next function or event. If you're looking for a unique musical experience, hire us. In addition to sharing our music with others, another great passion of ours is learning more about the art of a cappella singing. Vocal instruction is a regular part of chorus rehearsals, and a very important component of the chorus experience. Several times a year, we will get coaching from a visiting master in the art of barbershop, where we learn many fabulous tricks of the trade. Most choruses have a number of members who form their own vocal quartets in addition to singing with the chorus. Cranberry Shores Chorus currently is home to two wonderful quartets, and we are very proud of them! Cranberry Shores Chorus is a chapter of Sweet Adelines, International, a non-profit organization of approximately 30,000 members in choruses and quartets, worldwide. The Headquarters is in Tulsa, Oklahoma.